The monument commemorates the exploration voyage of Matthew Flinders in 1802. A large crowd celebrated Pioneers' Day at Ceduna last week, when a plaque commemorating the arrival of Capt. Flinders was unveiled by Mrs. E. C. Lowe, one of the oldest pioneers in the district. Mrs. Lowe was introduced by Councillor E. C. Dahl, vice chairman of the District Council, who had charge of the proceedings. Chronicle (Adelaide, SA), 6 May 1948. 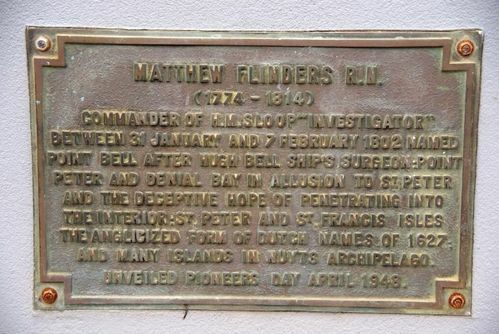 Commander Of H. M. Sloop " Investigator"
St Peter And St Francis Isles The Anglicized Form Of Dutch Names Of 1627 ; And Many Islands In Nuyts Archipelago.